Some call it chocolate hazelnut spread, but for me, it's a way of life. For real though, Nutella is a gift from God via the great nation of Italy. (The same place that brought us the greatest food known to man, one worthy of it's own food group — pizza.) Seriously, if you can name a better condiment, please let me know. Though eating Nutella straight out of the jar is delicious enough on its own, it's even better when it's incorporated into even more sugar! These Hazelnut Crunch cookies utilize one of my favorite cream cheese-based cookie dough recipes and fill it with all kinds of chocolate and hazelnut goodness. After adding nutella and cocoa powder to the dough, in goes a mound of milk chocolate chips, chopped kit kat bars, and crushed chocolate hazelnut wafers rolls. The end result is an amazing chocolate cookie with so much texture — the cookie itself is soft and gooey, yet the crushed wafer rolls add an amazing crunch to each and every bite. In the bowl of a stand mixer fitted with the paddle attachment, cream the butter and cream cheese until light and fluffy, about 2 minutes. 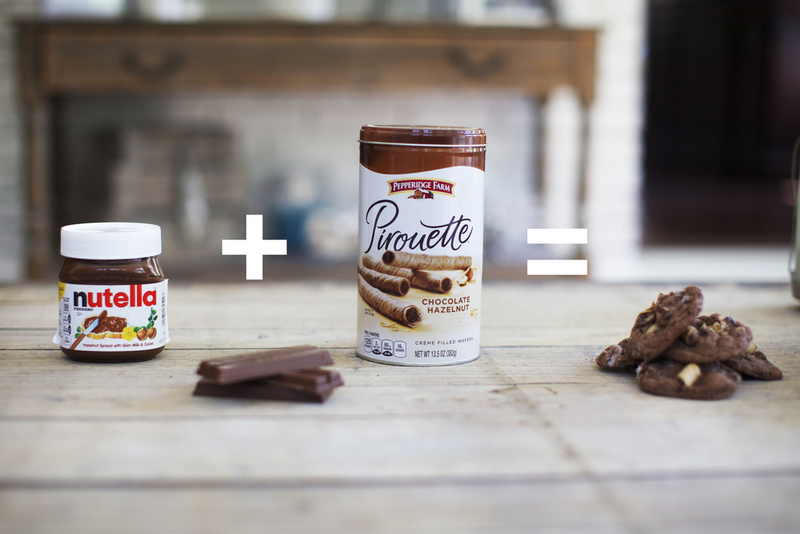 Mix in the nutella. Add the brown sugar and egg, mixing for 3 minutes more. Mix in the vanilla. Add all of the dry ingredients and combine. Fold in the chocolate chips, crushed kit kats, and wafer rolls. Roll the cookie dough into balls, then roll them in sugar, and place them on your prepared baking sheets. Top with extra crushed wafer rolls. Bake for 10 minutes, do not overbake.